Thanks to our cooperation with Europe's leading telecom operator, we are now able to offer a cutting edge technical training course on 5G NSA. You will enjoy and prosper from our hands-on experience with 5G NSA throughout this unique course. This experience is not limited to the European market but we have hands-on and fresh implementation experience for North America and Asia. The course goes pretty deep into both, 5G PHY and NSA specifics and you must possess basic knowledge of 5G and detailed knowledge of LTE PHY and RRC. How precisely does option 3x operate and how does it differ from other options? How does cell search work with 5G? How is it different between stand-alone and non-stand-alone? Which bands 4G / 5G are combined with MR-DC in different parts of the world? To which degree can beamforming mitigate the additional attenuation from operation in the 3.X GHz bands or even in millimeter wave bands? How do active antennas look like and operate for 5G operation? Which number of antenna ports provides the optimum performance under which conditions? What is vertical beamforming and when does it make sense to deploy it? Under which conditions can Inter-Modulation-Distortion (IMD) jeopardize NSA-operation and which options exist to mitigate these RF-related problems? When will the UE display the 5G icon to the user? What are the implications of deploying different subcarrier spacings with NR? Which additional problems arise from TDD-operation in cellular vs FDD-operation? What is the meaning of the GSCN and the SS-block pattern? How can NR deploy beam-centric operation already in idle mode? Why is there no more DC-subcarrier? What are self-contained TTI and dynamic TTI? Which reference signals does NR use and how is this different from 4G? Which performance gain to expect from mMIMO with more than 8 antenna ports on the network side? How does uplink beamforming operate? What are the NR- and MR-DC - specific contents of a UE-Radio-Access-Capability Message? How is a 5G cell added to an existing RRC-connection? Please check here for a detailed view on the content. Please send an eMail to inacon@inacon.de if you like further information. In 2017, the whole market was excited about NB-IoT but this year, many players in Europe and North America have identified a lot of potential in LTE-M, many times also referred to as Cat-M, operating in just 1.08 MHz bandwidth. Having been introduced with Rel. 13, Cat-M has been underestimated for a long time in both aspects: complexity and market potential. Finally, INACON is offering a bit-level course for everybody who requires really detailed knowledge about this technology, which is so much similar to plain LTE with all these tiny little differences. This course is structured into three chapters and enables a self-paced technology training experience for everybody who requires a fast yet comprehensive introduction into 5G and the technologies behind. What is the migration path towards 5G? In that respect, how does NSA work? What to expect in the PHY? Here we namely present the numerology of filtered OFDMA as it will be used in 5G. However, quite some focus is also on the new coding technologies LDPC and polar coding. To which degree will virtualization affect the network architecture in 5G? How can the so called gNB be split into a virtualized and a non-virtualized part and which role does eCPRI play in that matter? How can the envisaged extremely low latencies be realized with 5G? INACON releases this exciting new course to further complete our series on IoT technologies. Starting out with a general presentation of LRWPANs and their market, the course presents details of ZigBee and Thread as two typical LRWPAN-technologies. INACON is happy to announce the soon availability of our system engineering level course on NB-IoT. This course is targeted at everybody who requires really deep understanding of NB-IoT and its capabilities and liabilities. After a comparison among the different longrange IoT-technologies, the course dives deep into the RF, PHY and higher layers of NB-IoT and answers several questions. This course addresses the needs of technical engineering staff who work on the design, test, integration and validation of LTE-Advanced equipment esp. on the UE-side. The course has been designed to meet specifically the requirements of chipset verification, integration and testing. The course starts out with a description of the most important trends and visions, in the year 2016, namely the upcoming IoT, the increasing level of network virtualization, the migration towards 5G, the engagement between LTE and WiFi through different options like LTE-U, LAA or LWA and, last but not least, the ever increasing level of scope of carrier aggregation. Following this chapter, the course reviews the most relevant details of LTE from Rel. 8 up to Rel 11. Note that our trainer will tailor the level of detail and the time spent on this chapter depending on the existing knowledge of the course participants. The following two chapters are dedicated to a detailed description of the updates to LTE-A with Rel 12 and Rel 13. In these chapters, we cover the different levels of carrier aggregation enhancements with Rel 12 and 13, e.g. UL-CA, combined FDD/TDD-CA and the related constraints and practical implementation challenges. In this part of the course we also introduce dual connectivity and its specifics for the UE and for the network side as a new way to do intersite carrier aggregation. With Rel. 12, there is an exciting new market for 3GPP which is public safety, covered by the ProSe-, D2D- and sidelink- related parts of the specifications. We deal with this fascinating new technology and some of its specifics in this part of the course. Following a detailed analysis of various other enhancements like using 256-QAM modulation, the focus of the course changes to MTC and the IoT. We depict, which approach is taken by 3GPP to suit the needs of the IoT in a 3GPP-environment and point to alternative approaches like SigFox and Lora. The most important topics with respect to 3GPP, dealt with in detail are eDRX, PSM, SIM-less operation and the architecture and radio interface of the NB-IOT. Last but not least, the course focus is on LTE-U, LAA and LWA and depicts the pros and cons as well as the specifics of these three different approaches to combine LTE-A and WiFi. "Network Virtualization: Details, Theory & Practice"
"Network Virtualization: Details, Theory & Practice". This course addresses the needs of technical engineering staff within telecom carriers and equipment and software vendors who are involved in the design, setup and testing of virtualized telecom network equipment and software. Special focus of the course is on the ETSI ISG-based reference architecture. To emphasize the meaning of SDN for NFV, we establish during the course a live virtual network using Mininet and demonstrate basic SDN and OpenFlow operation with Wireshark. From there the course pinpoints to cloud computing and the related business models like IaaS, SaaS, PaaS and makes the student familiar with the ideas of NFVIaaS, VNFaaS and VNFPaaS. The following parts of the course focus on the detailed description of the ETSI-reference architecture and make the students familiar with the different terms like MANO, NFVI and VNF, VIM VNFM and WIM. We explain in detail the configuration and setup of VNFs consisting of one or more VNFCs using differently configured virtual links. The next part of the course is dedicated to MANO-descriptors like the VNFD, VLD, NFPD and VNFFGD that are crucial for the configuration, operation and interworking of the virtualized network equipment. We depict examples and explain their meaning and potential errors step by tstep which is so important for testing commissioning. The next lecture deals with the optimization and acceleration of virtualized environments and describes which means exist for that optimization like localized memory (NUMA) and multiple core operation. This part also deals with potential performance killers like interrupts and how to mitigate their impact. Then please click here to obtain more details about this course or contact us. This course addresses the needs of engineers and technicians, who need to get familiar with eMBMS. The course provides an overview of the important video broadcasting technologies, such as Digital Video Broadcasting (DVB) or Digital Multimedia Broadcast (DMB) and compares them to eMBMS. Having the general broadcasting overview in mind, the subject will be expanded with the specific architecture of MBMS for both UTRAN and eUTRAN. We will explain the reference points, new network entities, operation modes and important session scenarios. Clear focus is on eMBMS with the description of new channels like MCCH or MTCH. Another important focus is the eMBMS operation within E-UTRAN and EPC. Protocol extensions like SYNC and new network entities like the BM-SC and the MBMS-GW will be dealt with in detail. The MBMS user services, such as service subscription, data delivery, charging, security and QoS, which use the bearer services explained before, will be presented in detail. Some important service scenarios will intensify the understanding of eMBMS services. LTE-A Rel 12 and Gigabit-WiFi 802.11ac/ad were held back to back last week onsite with tremendously good feedback from the VIP-customers which came together from all over North America. 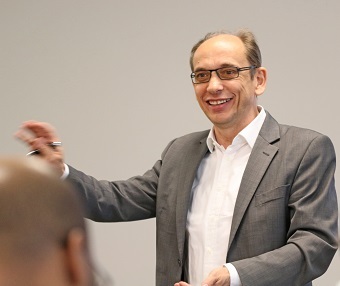 Gunnar himself was the author and the trainer of the courses and enjoyed the time amongst the very engaged audience. We like to thank the CETECOM team for their great job in hosting the event and sponsoring the social event. We also like to express our appreciation to all the customers asking this incredible amount of questions. "From IEEE 802.11n to 802.11ac and ad"
"From IEEE 802.11n to 802.11ac and ad". This course focus is on the VHT-related enhancements which the IEEE specified in the 802.11ac extension of the WLAN / WiFi standard series. However, the course also explains the specifics of 802.11 ad and the differences between these two amendments. Starting out with a primer on "before ac", the course initially focuses on 802.11 operation with respect to channel access and resource sharing. Namely the different channel access functions DCF, PCF, EDCA and HCCA are dealt with in detail and their differences and specifics are pointed out. During this part, the course also repeats the most important other characteristics of the OFDM-PHY and the MAC-layer. This includes a detailed consideration as to how QoS may be enabled in 802.11. The following chapter starts with an overview of the different groups of features which are added by the "ac"-extension of the standard. This chapter concludes with the "live"-calculation of the ac-related performance figures under different circumstances (e.g. modulation scheme, channelization). After this, the course focuses on the description and discussion of smart antenna techniques, namely SU-MIMO (up to 8 streams), MU-MIMO, and beamforming with ECFB as defined for 802.11ac. The students will learn without needing any mathematical formulas, how these techniques work and how they are applied in 802.11ac. How does 802.11ac differ from 802.11n? Which features are inherited from 802.11n? How does WiFi support the distinction of different QoS-requirements? What are the various 802.11ac-related enhancements? And how does 802.11ac differ from 802.11ad? How shall session switching operate between legacy WiFi, 802.11ac and 802.11ad? Why does 802.11ac not support "greenfield" PPDU? How does CCA (Clear Channel Assessment) operate in 802.11ac? When is 256-QAM feasibly used in 802.11ac? How does the improved RTS/CTS-operation work in 802.11ac? What are the consequences of 802.11ad operating at 60 GHz? How does beam steering work in 802.11ad? What is the relationship between WiGig 1.2 and 802.11ad? How does MU-MIMO work in 802.11ac? How do WPA and 802.1X improve the WiFi-security? Which additional gain is provided by EAP? How do different EAP-procedures like EAP-TLS or EAP-AKA work? How exactly do A-MPDU and A-MPDU aggregation work and how do they differ from each other? will be answered during this course. This course has been tailored as interface information between the car industry on one hand and the communication industry on the other hand. Starting out with a description of the various Car 2 X communication types and peers, the course makes the students familiar with the feasibility and constraints of the different wireless communication technologies, namely IEEE 802.11, Bluetooth and 3GPP-based radio. In that respect, Car 2 X has specific requirements when it comes e.g. to reliability, security and connection setup times. The course concludes with the description of hot topics like eCall and SOTIS and depicts what the future may yield for all involved parties. "LTE Advanced - Rel.11 specific Enhancements"
"LTE Advanced - Rel.11 specific Enhancements". 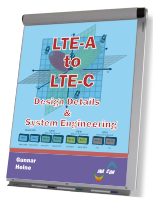 "LTE-A to LTE-C Design Details & System Engineering". in North America, to be hosted by our partner CETECOM Inc. in Milpitas, California on September 24+25, 2014. Top experts from within the industry are invited to join us and receive detailed technical information about LTE-Advanced in Rel. 10 up to Rel. 14. You may use the following link to register or ask more questions here. The course describes the voice over LTE options with special focus on IMS-based options and on SRVCC with SIP and SDP. We will start with an overview of the IMS related architecture with special focus on the LTE Access network and 3GPP interworking with other RATs. The course continues with the bearer concept and QoS architecture in LTE, discussing the procedures for default and dedicated bearer setup incl. interaction with the policy functions (PCRFs). Another focus is the detailed and practical analysis of the signaling and media stream protocols, in particular SIP and SDP, Diameter for policing and RTP / RTCP for voice and other media transport in LTE. Obviously, we will discuss in detail all relevant alternatives for voice over LTE  with and without IMS support, such as SRVCC and CSFB. Hands-on analysis and description of scenarios and message logs for SRVCC and CS Fallback completes the course. "LTE-A to LTE-C Design Details & System Engineering"
This course addresses the needs of technical engineering staff who work on the design, test, integration and validation of LTE-Advanced equipment, both network and UE-side. The course provides a thorough review of LTE-releases 8 and 9 before jumping deep into everything you need to understand about design details and system engineering in LTE-Advanced. Starting out with the details of carrier aggregation, the following chapters are dedicated to all LTE-Advanced features like the new MIMO-modes, HetNet-operation, the integration and operation of relay nodes, the improvements with eICIC and feICIC and a detailed description of the new features with Rel 12 and their realization like for instance "new carrier type", MTC and D2D. Apr 12, 2013: New Training Course "Bluetooth Operation, Procedures and Testing - Reloaded"
"Bluetooth Operation, Procedures and Testing - Reloaded". We are pleased to introduce our new training course "Bluetooth Operation, Procedures and Testing - Reloaded". This unique course first explains the origins of Bluetooth and the business perspective of Bluetooth. The student obtains a detailed knowledge about the various sources and administratives for a successful Bluetooth implementation. The next part of the course is dedicated to the core specification of Bluetooth and a detailed consideration of the various parts of the Bluetooth protocol stack, including functions like pairing, security or power control and energy saving modes (e.g. BLE). Special focus is given to a detailed understanding of the lower layers of the Bluetooth protocol stack (Baseband, Link Controller, Link Manager) and an understanding of the signal processing chain within the Baseband. How does EDR 2.0 Mbit/s and 3 Mbit/s work? What is new with Bluetooth version 3.0 and 4.0? What are the functions of the various layers of the Bluetooth Protocol Stack and which layers do I need to implement my feature set? How can I test my Bluetooth implementation and what will be tested? Feb 06, 2013: New Training Course "Android and Mobile Network Technologies"
"Android and Mobile Network Technologies". This new course will present mobile network technologies from the perspective of Android terminal equipment, covering legacy voice services with GSM and its evolution through UMTS / HSPA up to most recent technologies, such as LTE. The student will become familiar with the 3GPP specific terminologies for the radio, core and service delivery domains. The main focus is on the architectural view from both the user equipment and the network side, mapping 3GPP signaling and protocol stack and interface entities to ANDROID functions, libraries and interfaces. Although this is not an ANDROID OS specific programming training, we will at least provide an overview on the programming environment and packages required to build custom communication applications. Finally, the course will also cover service specific requirements for ANDROID based communication systems, such as roaming considerations between different access networks, realtime requirements for e.g. combined video and voice service deliveries and integration of provider specific functionalities. What are the main differences in the baseband modems in terms of access technology between GSM, UMTS, LTE and WiFI? How does the communication and service delivery work towards a Mobile Network? How are ANDROID communication functions - such as voice and non-voice features  mapped to the network transport protocols and functions? What is Smartphone Architecture as viewed from 3GPP on one side and from the ANDROID perspective on the other side? Which are the main communication protocols that are supported and for which purpose? What are the main components and libraries an ANDROID system is composed of? Which are the most important tools used to build an ANDROID system? Which are network services on an ANDROID system, that may require special attention and why? Dec 14, 2012: New Training Course "How to Manage IPv6 Deployments"
"How to Manage IPv6 Deployments". This course focusses on identification of the most critical IPv6 deployment issues and will provide some guidance for smooth transition from IPv4 to Ipv6.We will identify different problem areas, e.g. around dual stack host implementations, OS dependencies with migration strategies, incompatibilities with DNS / DHCP requests and addressing schemes as well as different supported feature sets at network nodes (gateways, routers and servers). In order to understand all possibilities and procedures, we will start with a discussion of all IP header field elements, identify all parts that have been inherited from IPv4, clarify the terminology and explain all the new header elements, their purpose and intended usage. The IP header structure will be completed with the detailed consideration of the new concept of Extension Headers in IPv6 and the purpose and usage of each of the options. We will then thoroughly discuss the address structure of IPv6 with the formats of Unicast, Multicast and Anycast addresses and what the options are to obtain a valid IP address. "GigaBit WiFi: IEEE 802.11ac and ad in 3 Hours"
This webinar provides a fast track to the concepts and technology of the latest extensions of the WiFi-family, which are 802.11ac and 802.11ad. Which changes do 802.11ac and 802.11ad provide and how do they compare to e.g. 802.11n? What is the current status of the standardization of 802.11ac and 802.11ad? How do both technologies differ from each other? Which devices are already there and when to expect a wide availability of devices, supporting 802.11ac and/or 802.11ad? Which technical enhancements are used to provide the better performance of 802.11ac and 802.11ad? Which of the new features are mandatory or optional for AP and STA according to th already there and when to expect a wide availability of devices, supporting 802.11ac and/or 802.11ad? Which of the new features are mandatory or optional for AP and STA according to the current status of the standardization? will be addressed in this webinar. Then please click here to obtain more details about this webinar, or contact us. Our CEO, Mr Gunnar Heine, has been invited to talk during that congress about LTE and its potential issues focussing on the use within the automotive environment. Special attention will be put on topics like frequency availability, voice as application and coverage. Then please click here to obtain more details about this Congress. Jul 19, 2012: Consultancy: LTE Drivetests Analysis for Network Operators"
INACON is happy to announce a new service that we provide to our customers: This service of drive test and drive test analysis evolves around the tools of our partner Focus Infocom and enables operators of 2G, 3G and 4G networks to obtain an independent and competent screenshot and analysis of their network situation in specific areas and at critical spots. First projects have been successfully completed, other are still underway and we will be happy to address your network issues together with you in the near term future. Please contact us through email (inacon@inacon.de) or by phone (+49-721-95 78 29 0) to obtain further details. Jun 26, 2012: New Training Course "IMS and SIP Signaling – VoLTE"
"IMS and SIP Signaling – VoLTE". We start with an overview on the IMS related architecture with special focus on the LTE Access network and 3GPP interworking with other RATs. We then introduce the bearer concept and QoS architecture in LTE / SAE discussing the signaling for default and dedicated bearer setup, e.g. IMS triggered with the interaction with the policy functions (PCRFs). A central part will be an introduction to the signaling and media stream protocols, such as SIP / SDP, Diameter for policing and RTP / RTCP and their applicability for voice and other media transport in LTE. We then discuss in detail the alternatives for voice over LTE – with and without IMS support, such as SRVCC, CS Fallback and also quickly review other solutions such as VoLGA etc. Related scenarios and different use case for SRVCC and CS Fallback – including SMS transmission – will then conclude the course. May 14, 2012: New Training Course "DIAMETER and Charging in LTE/IMS"
"DIAMETER and Charging in LTE/IMS". This course describes in detail structure and application cases of the Diameter protocol. An important part of the course will cover the policy control architecture and the alternatives with the logical entities PCEF and PCRF in a distributed environment as well as Diameter signaling routing and the use and purpose of Diameter Routing Agents (DRA's). We will then review the various applications and interfaces developed by 3GPP for Diameter and will particularly focus on Diameter in the IMS and EPC environment for Authorization, Authentication and the usage in the security architecture. The Diameter Cx / Dx, S6, SWx and Sta interfaces will be evaluated in detailed with selected scenarios and sample log files to explain interworking with the HSS and AAA servers in 3GPP. The details of the commands and parameters of the Sh and Dh interfaces will explain the communications with application servers in the IMS environment with the access and update of profile information and access rights. What are the main differences between RADIUS protocol and its successor Diameter? How is the Diameter protocol structured and which applications and interfaces are supported by IETF and 3GPP? Which are the generic functions supported by the Diameter Base Protocol part and which services are being covered? What is the Diameter protocol stack in detail and which transport protocols are being used? How is Diameter used in the IMS environment, which functions are realized and how? Which commands are used on the Cx / Dx, interfaces? Where is Diameter used in the EPC and what are the interfaces? Apr 19, 2012: New Training Course "LTE Advanced from A-Z"
We are pleased to introduce our new training course "LTE Advanced from A-Z". The main focus of this course is the evolution of the LTE system towards LTE Advanced based on Release 10 and beyond (Release 11). The first sections cover specifics of the enhanced radio concepts of LTE Advanced increasing the peak and average data rates per user. Focus of the first section is carrier aggregation (CA). This includes detailed look at implementation options and the control channel design. Keywords are cross carrier scheduling, PUCCH Format 3, Carrier Indicator Field, HARQ operation, CQI and PHR reporting. The next section illustrates the enhanced MIMO concept in downlink and uplink. The modifications for PUCCH, PDCCH, PDSCH and the new reference signals (CSI-RS, DM-RS) will be discussed for both directions. One section provides an introduction to Coordinated MultiPoint transmission and reception (CoMP) which is still in the standardization process. Additional sections discuss features which help to manage future LTE networks. This includes enhanced functionality of LTE Home Base Stations (HeNB), Heterogeneous Networks (HetNet) and LTE relay nodes as well as using UE measurements to minimize drive tests (MDT). Special attention is put on features affecting the performance of UEs. For example the Almost Blank Subframe (ABS) required for enhanced Inter-Cell Interference Coordination (eICIC). What are the main improvements of LTE Advanced compared to LTE? How does HARQ work with carrier aggregation / enhanced MIMO? What is a component carrier? Will LTE Advanced features affect the performance of legacy UEs? What is Coordinated Multipoint Transmission (CoMP) and how does it work? Mar 12, 2012: New Training Course "UMA/GAN from A-Z"
We are pleased to introduce our new training course "UMA/GAN from A-Z". This new course addresses the needs of everybody who requires a thorough understanding of generic access operation and procedures. The course starts with an introduction into the current implementation situation of UMA/GA and it continues with a detailed discussion of WiFi and its operation as baseline for generic access. This part covers the physical layer as well as the MAC-layer and includes an overview of 802.11n and WiFi-security methods. In the next portion, the course focuses on GA-elementary procedures like GANC-discovery and registration and the GA-integrated security procedures like IKEv2, EAP-SIM and EAP-AKA. The courses concludes with a detailed description of GA-based layer 3 procedures like call setup and short message delivery. This part includes detailed handover and rove in/out procedure presentations between WiFi and GSM and WiFi and UMTS. Oct 20, 2011: New Training Course "LTE Evolution and the Way to 5G"
"LTE Evolution and the Way to 5G". We are glad to pre-announce the soon availability of our new course "LTE Evolution and the Way to 5G". The main focus of this 2-day course is the evolution of the LTE system from LTE to LTE-Advanced (3GPP Rel. 10 and 11) and beyond. After a recap of the key parameter of the LTE access scheme, as well as MIMO, the course lists the motivating factors to migrate towards LTE-Advanced. In addition the course presents other evolutions inside the system, which include functions of SON, interworking challenges with other RATs and finally an outlook towards 5G. Can HSPA+ ever be considered as a 4G technology? What are the main improvements of LTE-Advanced compared to LTE? How does LTE-Advanced meet or even exceed the ITU 4G requirements? What are the business drivers of SON and where can SON help? Jul 18, 2011: New Training Course "IMS from A-Z - Reloaded"
"IMS from A-Z - Reloaded". We are pleased to introduce our updated training course "IMS from A-Z - Reloaded". This course addresses the needs of everybody who needs to understand the technology and services of the IMS. New sections focus on voice over LTE functionality utilizing an IMS domain and the reasoning for this architecture according to 3GPP Rel. 8. We will also provide an actual deployment status overview for the different rollouts in Europe and North America. The course concludes with the presentation of a real-life implementation of an IMS. Why is IMS becoming an important complement for mobile operator's LTE deployments? What is the deployment status in Europe and North America in combination with LTE? Where is LTE mobility an issue vs static LTE rollouts (settop boxes / DSL replacement and complement)? What are typical IMS-specific applications and services like "See what I see" and how do they work? What are the functions of the different network nodes inside the IMS? What are the differences between different SIP-server types like proxy, B2BUA and SBC? How do real-life implementations of the IMS look like? Dec 13, 2010: New training course "From LTE to LTE-Advanced"
This course addresses the needs of technical managers, engineers and technicians who are involved in the design, consideration and development of LTE and other 3GPP cellular standards and in particular the evolution from LTE to LTE Advanced. The course focuses on both sides, UE/Mobile as well as network. We will discuss in detail the changes and enhancements that will be introduced with LTE-Advanced, such as the increase in throughput, Spectral Efficiency, the relationship with LTE, Carrier Aggregation, Coordinated Multipoint Transmission and the use of Relay Nodes. 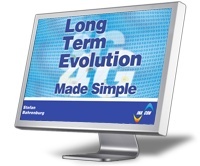 What are the technologies behind the various specification evolutions from 2G to 4G abd what is the current status of the LTE implementations? How does a voice call setup work with LTE, what are the options and what are the benefits of using VoLGA or IMS? How does Intra- and Inter-Band Carrier Aggregation work to obtain the required system bandwidth? Did we make you curious? Then please click here to obtain more details about this course or contact us. Oct 19, 2010: New training course "LTE - Interworking with WiFi"
"LTE - Interworking with WiFi". This course addresses the needs of managers, engineers and technicians who are involved in the design, consideration and development of interworking implementations between LTE and other 3GPP cellular standards on one hand and WiFi on the other hand. In that respect, the course focuses on both sides, UE/Mobile as well as network. Why is there a need for WiFi to interwork with the EPC of 3GPP Rel. 8 and later and what are the different options for network access? How does a voice call setup work with WiFi, what are the options and what are the benefits of using VoLGA or IMS? How is authentication of the terminal being done in case of roaming through WiFi instead of using LTE access? Which roles may the network and the UE take on when it comes to interworking? How is access permission being handled in case of non trusted non 3GPP access networks? 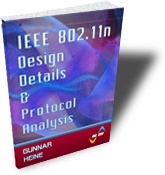 New eBook / Book "IEEE 802.11n - Design Details and Protocol Analysis"
We are pleased to announce that the training course manual "IEEE 802.11n - Design Details and Protocol Analysis" in now available to all customers as ebook and also as hard copy. This ebook / book describes in detail HT-related enhancements which the IEEE specified in the 802.11n extension of the WLAN / WiFi standard series. Starting out with a primer on "before n", the course initially focuses on 802.11 operation with respect to channel access and resource sharing. Who should obtain the "IEEE 802.11n - Design Details and Protocol Analysis" materials? Test engineers who need to understand the 802.11n-features and their implications in detail. Designers of 802.11n-equipment who require a deep inside view of the various enhancements. If you are interested in the "IEEE 802.11n - Design Details and Protocol Analysis"" ebook or book, please click here to view more detailed information about the ebook, and please click here for further information about the hard copy version. We proudly like to introduce our new Webinar "DIAMETER in 3 Hours"
Within 3 hours "DIAMETER in 3 Hours" provides a fast track to the concepts and technology of the DIAMETER protocol as successor of RADIUS. The webinar "DIAMETER in 3 Hours" starts out with at top-level view at the various use cases of DIAMETER with focus on 3GPP-specific applications. What is DIAMETER and how does it differ from other AAA-protocols, namely from RADIUS? How does DIAMETER operate within different environments like the IMS or the SAE? What is the structure of a DIAMETER-message? Mar 31, 2010: German Version: Web Based Training "LTE Made Simple"
Wir freuen uns bekanntzugeben, dass es unser Web Based Training "LTE Made Simple" nun auch in deutscher Sprache gibt. Diese Web Based Training ist für diejenigen, die die Technologie und die Konzepte von LTE verstehen müssen, sowie den künftigen 4G-Standard von 3GPP. Bitte klicken Sie hier, um die allgemeine Inhaltsbeschreibung zu lesen. Es gibt auch eine Demo-Version, auf die Sie kostenlos zugreifen können. Sollten Sie irgendwelche Fragen haben, zögern Sie bitte nicht uns zu kontaktieren, wir werden Ihnen gerne behilflich sein! Der einfachste Weg dieses Web Based Training zu bestellen ist über unseren Online-Shop. We are pleased to announce that our Web Based Training "LTE Made Simple" is now also available in German language. This Web Based Training addresses the needs of everybody who needs to understand the technology and concepts of LTE as the future 4G standard of 3GPP. To read the general content description, please click here. There is also a demo version available to be accessed free of charge. In case you had any questions, please don�t hesitate to contact us, we�ll be happy to assist you! The easiest way to order this Web Based Training is through our online shop.